Heading into October, candidates from both parties were set to wage the battle for both houses of Congress along familiar policy lines. 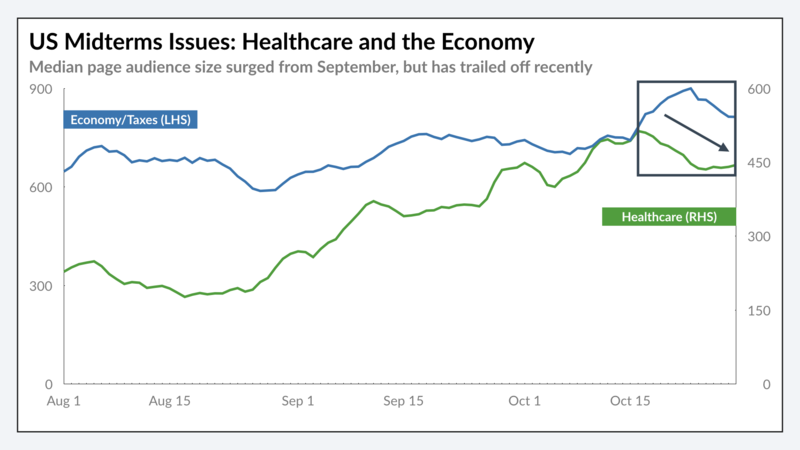 Between September 1st and October 25th, online interest in healthcare and the economy–as measured by web research traffic volume–rose significantly, with the median audience size increasing by roughly 50% on pages related to both subjects. Reflecting this, the Kaiser Family Foundation found in a poll conducted between late September and early October that voters identified healthcare and the economy as their most important issues. 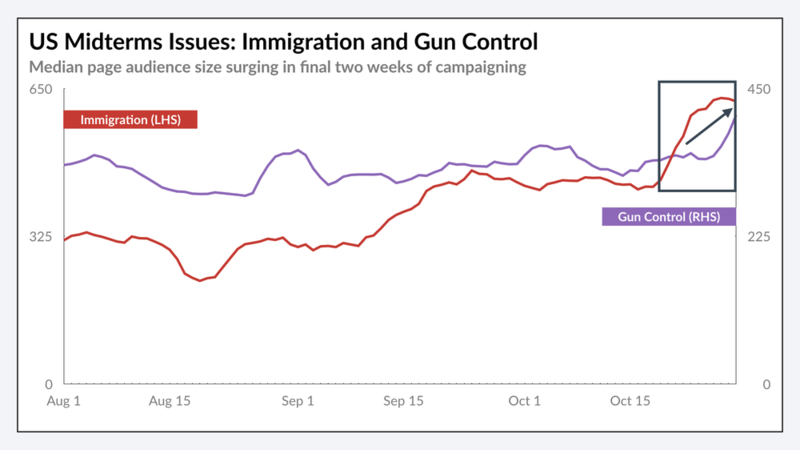 However, entering the second half of October voter attention appeared to shift, with momentum around healthcare and the economy slowing–median page audiences decreased 13% and 10% respectively since peaking–as interest in immigration policy and gun control, have picked up . Interest in immigration surged as the Trump Administration mobilized to respond to the migrant caravan en route to the southern border from Honduras. The caravan has driven interest in immigration to rise by 45% since President Trump first tweeted about it on October 16th. Research into gun control policy was increasing even before Saturday’s mass shooting at a synagogue in Pittsburgh and has continued to climb, reaching its highest level since the Parkland mass shooting this past February. Foreign policy is not typically at the forefront of voters’ minds in Midterm Elections. 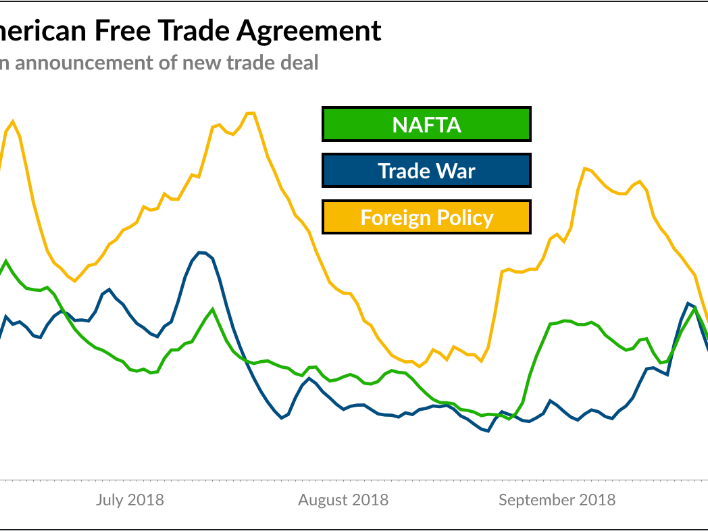 Nonetheless, interest in the Trump Administration’s foreign policy positions and achievements has sustained momentum over the past few weeks. 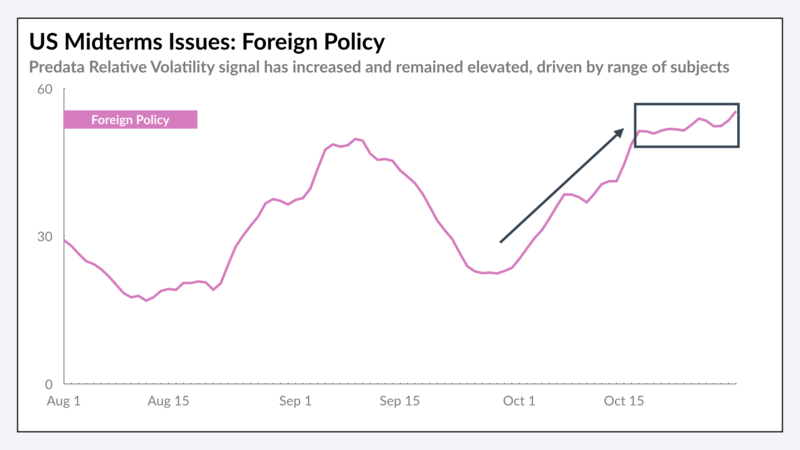 Predata’s Relative Volatility signal–an algorithm that highlights concurrent traffic surges across multiple web pages related to a topic–for Trump’s foreign policy reached its highest level since the Trump-Putin summit in July. 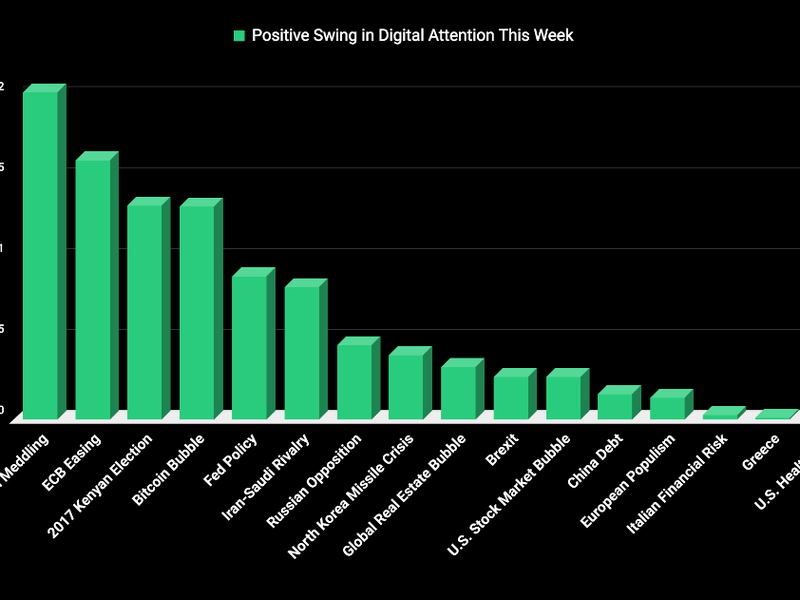 No one issue appears to be having an outsized impact in driving interest in Trump’s foreign policy, suggesting that the surge in momentum the Relative Volatility algorithm detected consisted of small, but appreciable, increases in attention to multiple topics. In our last newsletter, we noted how allegations of sexual assault against Supreme Court nominee Brett Kavanaugh drove increased scrutiny of the court itself. 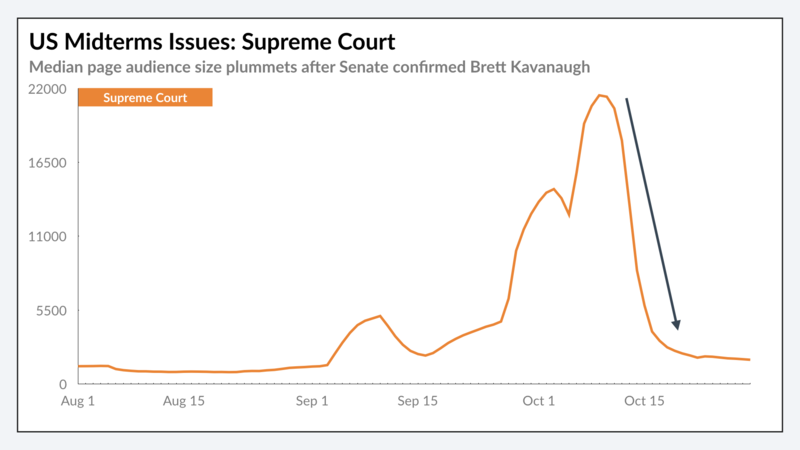 Since the Senate voted to confirm Kavanaugh, interest in the Supreme Court has collapsed. It is to be seen whether President Trump’s announcement of an executive order that will end birthright citizenship in the United States, with significant constitutional implications, will bring voters’ attention back to the Court or whether it will simply continue to fuel increased concern over immigration policy.